learn skills to prevent & respond to your child’s behaviour. These workshops are for parents, grandparents or siblings of children and young people (up to 25 years old) who have moderate to severe learning disabilities. 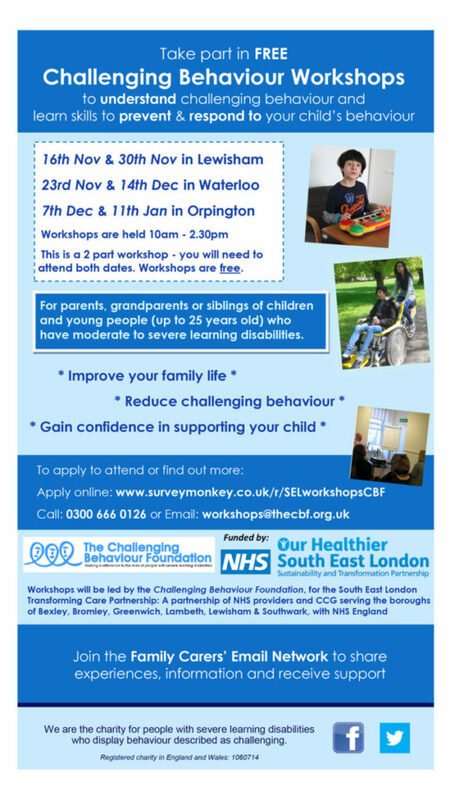 Workshops will be led by the Challenging Behaviour Foundation, for the South East London Transforming Care Partnership: A partnership of NHS providers and CCG serving the boroughs of Bexley, Bromley, Greenwich, Lambeth, Lewisham & Southwark, with NHS England.